While the carpenter bee can sometimes be mistaken for a bumblebee, it is by no means the same as it pertains to the damage they can cause to wood. Carpenter bees can be incredibly destructive to a the wooden structures, beams, stairs and other elements within any commercial facility, and they are particularly destructive to unfinished wood. This is because female carpenter bees have the ability to chew circular tunnels into wood, and their appetites can be insatiable once they start tunneling. Unfortunately, once enough tunnels are drilled into your wooden structures, or they are expanded, serious structural issues within the wood arise, often causing wood to snap or crumble. Read on to learn more about the habits of this insect, what to look for by way of infestations, an in-depth description of the pest control methods our technicians employ to protect Pittsburgh and Western Pennsylvania business facilities, or contact Pestco Professional Services for any pest control need (412) 252-5200. Click the carpenter bee to schedule an inspection! Carpenter bees are large solitary insects with purplish wings that nest in tunnels bored into dead wood or plant stems. So named for the fact that they burrow into wood to build their nests and lay their eggs, these insects resemble bumble bees. They are, however, very different critters. 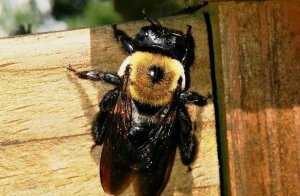 Carpenter bees have a shiny, hairless abdomen, unlike bumblebees, and the latter nest in underground abandoned rodent burrows rather than wood. They also do not live in colonies like other bees. Their homes are previously constructed brood tunnels. Within the United States, there are two general types of carpenter bees: large (Xylocopa) and small (Ceratina). The former is the group most likely to make their presence and associated damage known to commercial space and property owners. They are particularly attracted to unpainted or untreated soft woods such as cypress, pine, cedar and redwood. Even though they are a solitary species, carpenter bees tend to be gregarious, and often nest near each other. When females cohabit a nest, a division of labor often occurs between them, where one female may linger mostly near the entrance guarding the larvae within the nest, another may spend most of her time foraging for provisions. During the winter months, these bees hibernate within the brood tunnels that have been previously constructed. Those that survive, emerge and mate in the spring. It is at this time of year that damage to wood structures of all kinds occurs. Sometimes, visible indications, such as a buildup of sawdust below the opening, may be present. Other clues that indicate carpenter bees are near will be black stains consisting of waste material excreted by the female bee as she excavates the wood. After boring for a little bit, the bee makes a perfect right angle turn and continues to tunnel parallel to the surface of the wood. Within the tunnel structure, some five or six separate cells are built expressly to house individual eggs. The bee provides each cell with a single egg and pollen collected from spring-flowering plants, which is the food source for the developing larvae. The bee then seals each chamber with regurgitated wood pulp. When the new generations emerge late in the summer months, they forage on flowers. In the fall, they return to the wood where they hibernate. Female carpenter bees excavate new tunnels in wood where they lay their eggs or enlarge and reuse old ones. Male carpenter bees are very territorial around the entrance to the nest, as they lie in wait for a female to emerge so that they can mate with her. They dive bomb in the faces of humans and other bees until all the new females have mated and then they die. They do not have stingers, but no one would ever know that since they can be very aggressive. 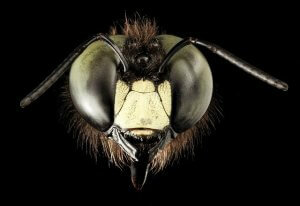 Only the female carpenter bee has a stinger, which is only used if the insect is provoked. Insect pollinators, such as honeybees, contribute a value of around $29 billion to our agricultural industry with about 15 percent of this figure coming from native varieties like the carpenter bees. The biggest problem with assessing damage caused by carpenter bees is the fact that the total effects of an infestation do not show themselves until it is too late. Early signs, such as drilled holes in wood, should promote a call to action to our pest control and pest management specialists at Pestco Professional Services. How much damage these insects do can be compared to that old saying about ‘the straw that broke the camel’s back.’ Drilling and more drilling over and over in the same spot, like piling straw upon straw upon a camel’s back, eventually weakens the internal structure of wood (and that poor camel’s back). Finally, unable to sustain itself, the wood collapses, decays and rots. Nesting sites include eaves, rafters, fascia boards, siding, wooden shake roofs, decks and outdoor furniture. The destruction occurs when the same pieces of wood are infested over and over again as the holes bored by the insects also facilitate moisture and subsequent decay and rot. Commercial pest control and pest management is not for amateurs. Although there are some things the average business manager or homeowner can do to prevent a carpenter bee invasion, insuring that these insects don’t return can rarely (if ever) be achieved without the intervention of professional pest control services. Home remedies include the use of harmful pesticides, which we do our best to avoid. Deciding to go that route, the first step is to find a way to stop these bees before they fully construct their tunnels. Liquid, aerosol or dust insecticides can be applied directly into the tunnel openings. For best results, leave the holes open for a few days afterwards, which will give the bees enough time to distribute the insecticide throughout the nesting area. The next step is to plug up the numerous unsightly points of entry with a piece of wooden dowel that is coated with carpenter’s glue, putty or other effective sealants such as: caulking, wood filler or even steel wool. This will prevent future bee generations from utilizing previously built tunnels and will also help in keeping the area dry and safe from wood decay. Lastly, keep all exposed wooden surfaces well painted with a polyurethane or oil-based paint. Considering that carpenter bees only bore into wood, any non-wood material, such as vinyl siding or aluminum, can be substituted to prevent infestation. It all started with one man. He was a Lithuanian immigrant named Milton Zlotnick, who first learned about pest control while serving in the United States Army during the turbulent years of World War II. In 1946, he went to work for his uncle, Bob Surloff, who invented the world’s very first fan-operated air freshener and named it Air-Scent. In 1948, Milton Zlotnik officially launched Pittsburgh Exterminating Service and Termite Control (which later became Pestco Professional Services). Company headquarters were in his home, where operations were maintained with the help of his wife, Marion (Mimi). Zlotnik perfected his skills and expanded his knowledge by becoming acquainted with Pittsburgh’s leading entomologist of the day, Arnold Mallis, who authored the iconic Mallis Handbook of Pest Control, which was considered the bible of urban entomology. Over the course of more than seven decades, we have blossomed and maintained an unblemished reputation for superior customer service, and we service many high profile clients throughout the Greater Pittsburgh area, including Heinz Field, PNC Park and a swath of commercial businesses throughout Western PA, Eastern Ohio and the West Virginia panhandle. Our knowledgeable and highly trained technicians can provide the answers to every emergency pest control and pest management question under the sun, and our solutions are steeped in extensive experience that are based on the principles of prevention; inspection; detailed exclusion; understanding insect and rodent behavior and the ability to identify signs of any type of infestation. With seventy-plus years of experience, we are far ahead of our competitors in many ways, and our long-standing reputation is only matched by our continued respect for and preservation of the environment. This is demonstrated by our exclusive reliance on green, sustainable products that do not contain harmful pesticides that can greatly impact our carbon footprint and the legacy we leave for future generations. One of our grandest achievements concerns our three-pronged initiative, the Complete Facility Care program, which is currently available to owners and manager of all types of commercial spaces. Our highly trained and knowledgeable technicians provide the ultimate strategies for pest control and pest management services as just one of the three aspects of this cost-effective blanket of bundled services. The other two areas concern superior washroom hygiene services provided Enviro-Master and environmental odor and air freshening solutions supplied by Air-Scent International. Take advantage of this vast array of professional services. Harnessing them for use into even the most mundane of business settings can enhance any company’s hard earned reputation and all-important bottom line. Strive to become a pest-free establishment with clean, pleasant-smelling restrooms for both visiting customers and employees. Any business or industry that may be attracted to this cost-effective and superior offering, whether large or small, can benefit from its steadfast promise to stand behind all of its products and services at all times. Call our pest experts today and rest easy tomorrow. These insects have their place in Mother Nature’s universal order of living things. The following represent some interesting and little known facts about carpenter bees. Carpenter Bees Don’t Live Alone: These bees usually live in mated pairs, and the males emerge first to set up territories before they find mates. Carpenter Bees Have A Long Life Span: Carpenter bees have been known to live up to three years and there are usually just one or two new generations born every year. Only The Female Carpenter Bee Builds The Nest: The female carpenter bee will work hard to drill out a perfectly nickel-sized hole. She will dig a couple of inches in and then move at a right angle following the grain of wood. The Female Carpenter Bee Dies Shortly After Laying Her Eggs: A female carpenter bee will only lay 6-10 eggs in her lifetime, which is much less than other insects. It is usually just one batch of eggs, as the female dies shortly afterwards. The Female Bee Is A Precise Carpenter: The entrance hole carved into the wood surface is precisely round and about the diameter of a human pinky finger. Carpenter Bees Are Creatures Of Habit: Carpenter bees are known to return to the same place they were born, year after year. If they can, they re-use existing holes and create new nests, and if they can’t, they drill new holes to accommodate increasing populations. These Bees Can Make Sound Waves With Their Bodies: Via the muscles found in their thorax, carpenter bees can produce sound waves by pinging in and out and shaking pollen from their bodies. This practice is known as buzz pollination. Carpenter Bees Can Create Tunnels Up To Ten Feet Long: Although tunnel openings may appear to be only about one or two inches deep, they can be up to 10 feet long! Carpenter Bees Emerge In The Summer Months: Carpenter bees normally emerge from their brood cells in the month of August. During this time, the young bees will move from location to location, but they can also stay in the general area where they were born. Carpenter Bees Are Nectar Robbers: Carpenter bees forage during the early morning hours and their diet consists of nectar and pollen. They are unable to penetrate long, tubular plants, like the flowers of yellow bells, because of their large size. To compensate, they become “nectar robbers” and steal the nectar of these inaccessible blooms by cutting a slit at the base of the flower, thereby completely eliminating the process of pollination. Carpenter Bees Are Also Known as Black Bees: Within this genus classification, there are more than 500 diverse species. Nearly all of them are known to burrow into hard plant material such as dead wood or bamboo. Carpenter bees are also known as black bees because their lower abdomen has little to no hair and has a black and shiny appearance. Carpenter Bees Are Beneficial To The Environment: These bees are hardy pollinators, which aids the agricultural industry. Some farmers in dryer environments seek to attract carpenter bees for this reason. They are excellent pollinators of eggplant, tomato and other vegetables and flowers. Generally speaking, bees (including the honeybee) account for about 80 percent of all insect pollination.